Today has been a not so good, very bad day, kinda day. We had a break in the rain, so the kids and I went outside to tend to some 'unpleasant chores', namely, scooping dog doo. Nasty business altogether and generally makes me grouchy. Turns out, the terrier mix we have that has the run of the yard managed to 'use' every possible surface. 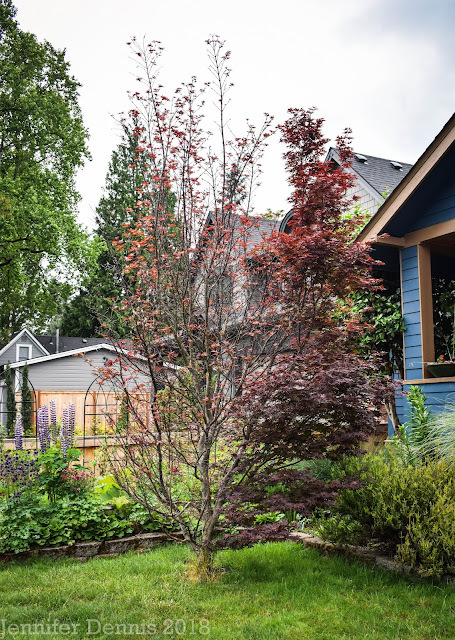 Gravel, flower beds (all of them), grass and even...my garden. To say that dog is in hot water doesn't cover it. I had even put mesh over the raised beds to prevent this problem. She knocked them down. After finding some rather nasty piles, on top of my plants, I came across three of my gardening tools, which had been stuck in the mud and left out for some time. My gardening tools have never been the image of perfection, but they have not had rust. The boy child ran and hid from me after he discovered I found his stash. Visions of Alice in Wonderland's Queen of Hearts came to mind with her famous line 'Off with their heads!' felt just about right. This whole parenting thing can be really overrated sometimes. So can dog ownership. As it stands, they are all in the doghouse and my fingertips are numb from spending the past 45mins scrubbing my tools with little wire wool scrubbies. Hubby has promised to bring home Chinese tonight to help sooth over my sore feelings towards anyone breathing. Ah well, I guess not everyday can be pleasant. 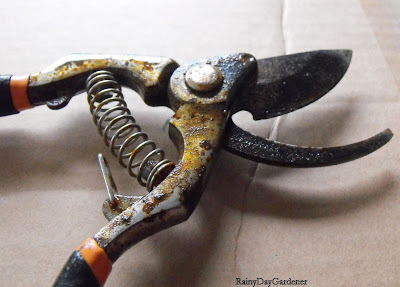 I found my Felco pruners on the potting bench outside recently and I almost cried when I saw all the rust. I feel your pain. Oh Jenni, I am so sorry. I get cranky if anyone else uses "MY" pruning shears, let alone my fork or my trowel, they have their own, really it is usually my Hubby who "forgets" these days. sistah, you know it! I'm missing you terribly and could use some Jana time!! Oh my...I hope tomorrow is MUCH better! A wise friend of mine said, "You'll feel better in the morning!" I hope that's true for you. Sorry about your day! What a horrible day! At least the poo your picking up is your pets, instead I get to pick up everything the neighbors cats leave me. That is if I get to it before my dog. Ya, gross. Oh dear. Must say our part time dog is good about avoiding the flower beds and stays on the grass. She has been known to see something on the flower beds that needs investigation and turn to see if we are watching - a 'No' usually confirms that any paws on soil are not welcome! WE have been known to find secateurs that have been left out on the plot but they haven't usually got to that state. I can understand why it was a bad day and everyone went into hiding! I feel for you about the doggy doo. Our 17 yo Daisy seems to do it as she walks down the paths in the garden. We always have to watch our step. Shame about the garden tools, glad you managed to clean them up. I leave lots of poo for mummy to pick up too. She said to try tomato ketchup if you don't have any cola. Then spray with WD40. I get so mad at my dog, too. I can't even enjoy my garden because I'm not looking at the plants - I'm trying to avoid stepping in 'it'! Sorry about the tools. I find things that are supposed to be for gardening all over the yard. All the twine used to hang toys from trees, stakes in awkward angles ready to poke me in the face. I've thought about doing a post once about the realistic part of gardening with kids and dogs, does take some of the fun out when you have to clean up after them rather than play in the dirt. Hope you had the sun we had today and you had some fun outside today! Today Max hit me in Fred Meyer because I wouldn't buy him a $6 toothbrush. We left empty handed. Later he told me I ruined the trip to the store and that he hates me. Lovely. Being at home is so hard sometimes. I feel your pain of this day you had!